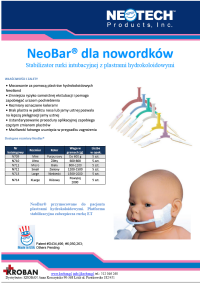 Neotech NeoBar dla noworodków - Stabilizator rurki intubacyjnej z plastrami hydrokoloidowymi - Kroban. Nr katalogowy Rozmiar Kolor Waga [g] Liczba w op. N709 Mini Purpurowy Do 600 5 szt. N710 Ultra Żółty 600-800 5 szt. N711 Micro Biały 800-1200 5 szt. N712 Small Zielony 1200-1500 5 szt. N713 Large Niebieski 1500-2000 5 szt. N714 XLarge Różowy Powyżej 2000 5 szt. 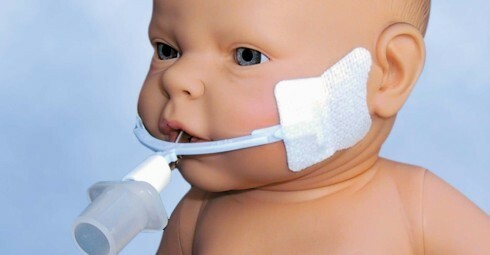 To determine the efficacy of a new neonatal endotracheal tube fixation device by evaluating the prevalence of known complications associated with its use during a five month trial period on the neonatal intensive care unit. Nursing and medical staff completed an evaluation sheet following each initial intubation, and on each subsequent day that the neonate remained intubated. The evaluation sheet contained a number of questions aimed at determining the occurrence of known complications associated with the device, as well as space for free text to highlight new complications. During the five month period 117 neonates were admitted to the neonatal unit. Thirteen neonates required intubation, a total of twenty two intubations in all. Data was obtained on all twenty two intubations. The correct size NeoBarwas used in 21/22 (95.5%) intubations. Difficulty in securing the endotracheal tube to the NeoBardevice was reported in one case (4.5%), with difficulty adhering the device to the neonate's skin in 4/22 (18.2%) cases. Concerns regarding a lack of adhesiveness of the device to the skin were recorded on day 1 (17.6%), day 2 (36.4%), and day 3 (33.3%) of intubation. Concerns regarding rubbing of the endotracheal tube against the neonate's lip were recorded on day 1 (5.9%), day 2 (36.4%) and day 3 (33.3%). Concerns that the NeoBar device was becoming detached from the endotracheal tube were recorded on day 1 (23.5%), day 2 (18.2%) and day 3 (33.3%). In no cases did any of these recorded concerns require any action to resolve. 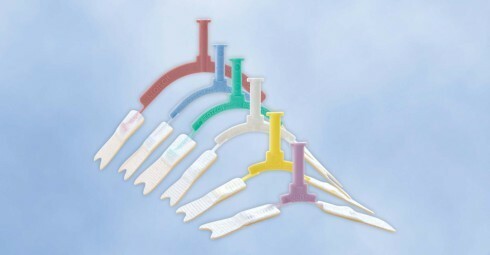 The NeoBar is a safe and effective device used for fixing endotracheal tubes on the neonatal intensive care unit. Complications, principally concerning loss of adhesion of the device to the skin or the endotracheal tube, and rubbing of the endotracheal tube against the neonate's lip were more prevalent the longer the neonate was intubated, but never resulted in the need to change the device or reintubate. As a result of our audit, all endotracheal tubes on our neonatal intensive care unit are now fixed using the NeoBar device.